In the last year or so, Huawei has been making a name for itself throughout the world, as they’ve been aggressive in pumping out some quality smartphones. However, even to this day, there are people who seemingly can’t grasp the proper way of pronouncing its name. Then again, who can blame them? Honestly, just looking at the word Huawei can make the average Joe toil in wonder as to how to pronounce it – and even worse yet, not everyone comes to the definitive conclusion on how to say it. Well people, Huawei is on the campaign to tell people how to say its name – properly! 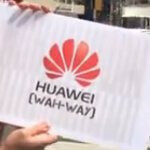 So yeah, it’s nice and all that Huawei is spreading the word on how to pronounce its name, but for the people that were interviewed, most of them were clueless as to what they do. Specifically, some of the guesses include being a car company, selling flowers, an airliner, or some kind of a small island. Luckily, one random individual managed to hit the spot in identifying them as an electronics manufacturer. Oh Huawei! It’s nice to see they’re educating the American public in how to say its name. actually looking at the katakana characters of the company... トヨタ spells "to yo ta" is defintely not a "toi" sound. If you write Toyota the way its pronounced in the US, it would look like... トイヨタ this is "toi yo ta", which is obviously not this company, otherwise the romanization would end up being "Toiyota"
You were right about Huawei, but aoikemono27 is right about Toyota. Even though it's TO YO TA or とよた (hiragana) "TO" is not pronounced as "TOE". It's Japanese, not English. "To" is "to", not "toe". ;) Vowels are not pronounced as diphthong in Japanese. It certainly is something to learn and I am happy that they are educating people in their name. Now they must focus on educating the public in why they should purchase their phones versus others. I made a joke about this a couple weeks ago and get like 10 thumbs down. And now they're having a campaign to teach american's how to say it. Somebody owes me a thumbs up. What? Electronics company? What kind of electronics do they make? They're soo underrated. I hope they evolve and start to create new things. Just because it's from china doesn't mean it's bad. I like them and I have my phone for one year and having fallen three times, not even one scratch. So many people don't know cellphone manufactures. Simply amazing. This is your standard consumer. We are cellphone freaks so of course we know them and of course the average person do not know the different brands. It's like someone asking you to name the manufacturer for a product you are not familiar or make a hobby of. I am aware sir. That's why I said "this is your standard consumer." Meaning all manufacturers should definitely do marketing campaigns to get the common consumer acclimated to their product. Hell, I still get friends who when they see my Nokia Lumia 900 they are surprised that there is a Nokia phone that isn't an old 3310. Weak and week are spelt differently to differentiate. Hey, if it's pronounced Wahway, they should write it wahway, doesn't matter if it's a Chinese name, we use alphabets, not chinese. Uh, its written in the roman alphabet, just like English, and dozens of other languages. English has no consistency anyway, so you will get a million responses regardless.